I’ve become an old China hand, at least in some superficial ways. 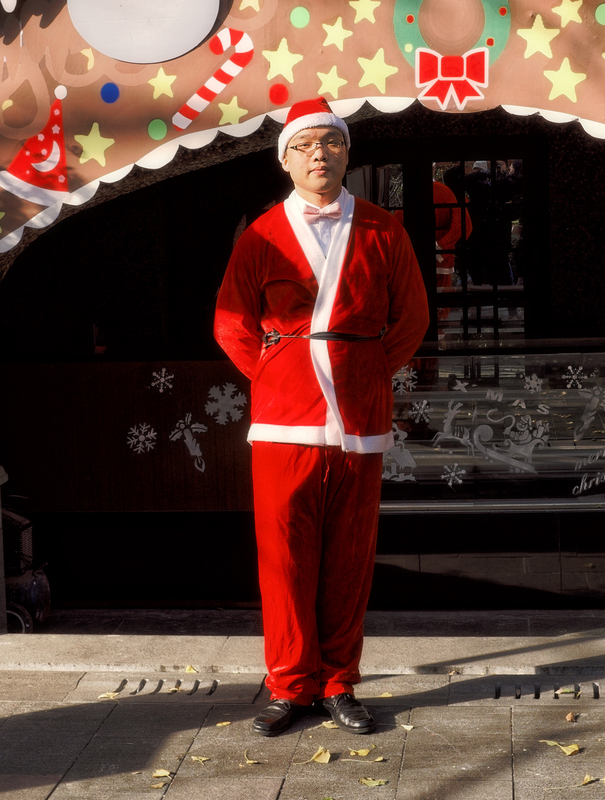 I’ve been to Shanghai a number of times over the years, and less frequently to a few other parts of China. I’ve seen the Great Wall, the terracotta warriors at Xian, the peculiar karst hills of Guilin, the giant Buddhas of the Longmen Grottoes, and stood with the fighting monks of the Shaolin Temple for a special photo. But sadly I only am able to speak the most limited of Chinese, in stock phrases to smooth my way, and certainly not to converse at any length. Mostly we go to Shanghai, because that is where my wife’s family lives. Shanghai has changed a lot in the 20 years or so I’ve been going there on a semi-regular basis. It’s now a city of high-rises, high-end shopping centres and high-volume car congestion. Without the Chinese characters there are many places where if you were set down unexpectedly it could be almost any modern city in the world. Fortunately for me, my in-laws were always cosmopolitan and well-travelled, especially my wife’s mother and father, unexpectedly so in Chinese of their generation. This befitted their role as medical doctors in demand at international conferences and other gatherings. In a way they became my second set of parents, after my own passed on many years ago. They always welcomed me into their relatively humble apartment, where in any conversation one might hear Mandarin, Shanghainese, English and French. As a Canadian, my high-school French actually became occasionally useful. And my wife’s dad spoke passable English, which certainly helped. The reason we went back for only just over a week this time was the final ceremony to lay to rest the ashes of my wife’s mother, who died earlier in 2014. She was a social live-wire even as she turned 90 years old, but endings find us all. It’s been very difficult for her husband of almost 70 years, especially since they were closely together all those years not only as partners in life but colleagues in their profession. I remember her most fondly for her jolliness, her sincerity and her intelligence. When they last visited us in Vancouver in Canada back when they were young folks in their late seventies and early eighties, they always seemed such accomplished travellers. Mom always liked to be photographed in front of every tourist sight-seeing mecca. Dad worried about plane tickets and travel arrangements. There were the rituals of packing, going to the airport and final waves as they left us each time. They weren’t able to visit us in the last decade or so — visas were refused due to their increasingly fragile health. So we — my wife more often of course — went back to see them in Shanghai. Her father now copes as best he can after his loss with the assistance of the extended family. Although his health remains relatively good, he doesn’t smile much any more. But he’s taken up occasionally singing and humming quietly to himself, whether to lift his spirits or as a way to commune with his wife, I don’t know. As we packed up to return to Vancouver, as we rolled the luggage into the living room and I worriedly checked that I had my passport and our tickets, Dad looked up at me with a brief, clear smile. There was acknowledgement of past moments together, of getting ready to go. We are all just travellers here. Whenever I go away from home, I’m keen to take photographs. I always hope that like Chesterton above, I will learn to see the places I know when I return with a little bit of that same exotic feeling and a refreshed eye. Here are a few photos from our trip. 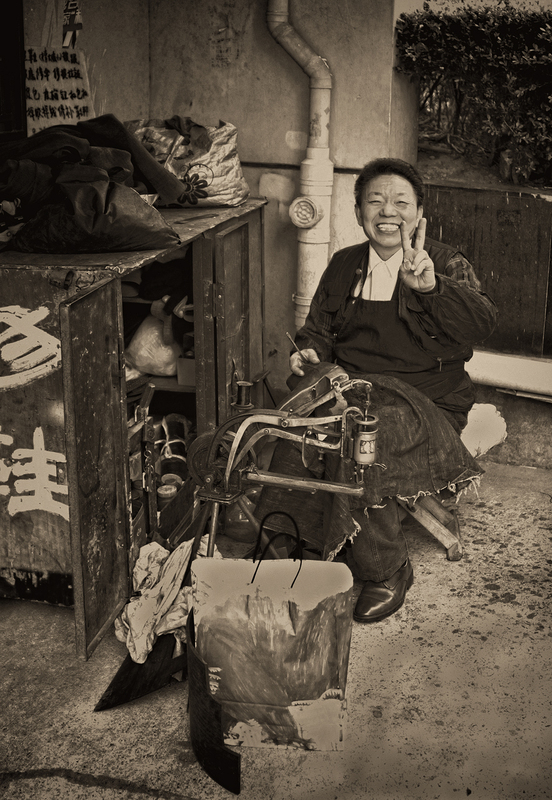 In Shanghai, there are many locals, such as taxi drivers we ran across, who resent Westerners always looking for the run-down parts of Shanghai to take photographs. They feel insulted by foreigners who don’t have a proper and respectful attitude towards the modernity of present-day China. 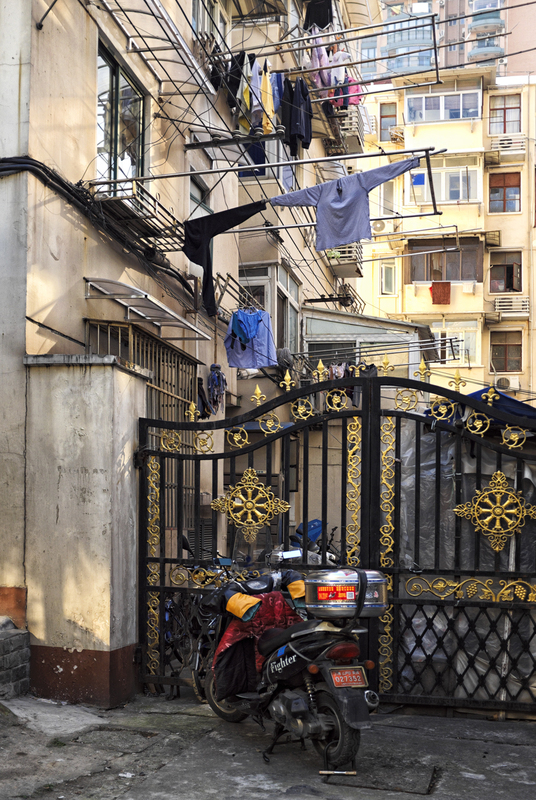 But the older, and not always run-down, streets of Shanghai still embody what all the sterile modernity can never do, a sense of community. More Shanghai photos will be seen on my photo blog, The Suspended Moment, as time goes by…. 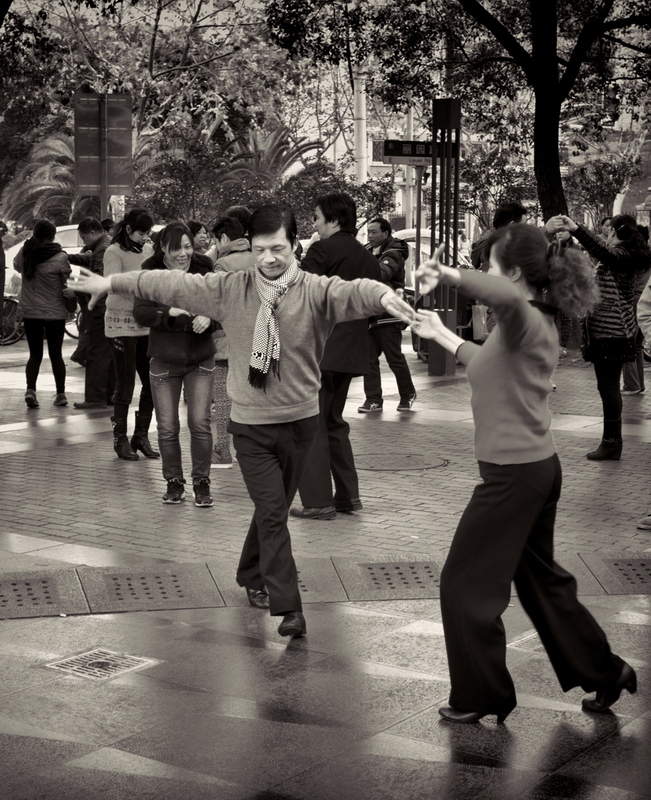 One short note about the photos: we came across a park where every day in mid-afternoon there would be community dancing. The local gossip was that many affairs were initiated at these events…. We’ve just returned from a trip to New Mexico. As recounted elsewhere (Of Money, Marriage, Dogs and the Nahanni Valley), my parents first met while attending classes at the University of New Mexico in Albuquerque. This was not long after the Second World War, in 1947-48 or so. My father probably arrived direct from Michigan, where our family on his side were mainly farmers, except in the case of my grandfather, who for a time was the owner of a furniture factory. There’s still a hamlet in Michigan, Bristol Corners, named after those who lived and died there for a few generations. Dad had returned home after savage fighting as a Marine in the Pacific against the Japanese. Before the war, he had painted sensitive oils and hunted with a passion. After the war, damaged in some ways, I think he returned seeking the most peaceful thing he knew, and tried to study art at the University of New Mexico. My mother was there from her home in Illinois, the daughter of an executive who spent the war in Washington, D.C. as a “dollar a year” man, and of a housewife and church organist. Political science was her major as befitted an opinionated and socially conscious young woman. My parents met, and decided they wanted to raise a family rather than wait to complete any degrees. They married and departed New Mexico, poor as winter, drifting first to San Francisco and then eventually to the Pacific Northwest. But their photos from that time, and the few items of the southwest we had about us as I grew up — a colorful patterned cloth, a rough Navajo rug, the Hopi prints they gave my grandmother — always seemed to me to be of exotic and adventurous origin. The few black and white photos especially, the stark shadows and brilliant light on adobe walls graced by noir characters in wide-brimmed hats, have always lurked in my memory. So when casting about for a new place to have a vacation, the thought of New Mexico, and making it a kind of casual pilgrimage to where my parents once found themselves together, made sense to me. Both my parents are long gone, my father in his forties and my mother in her early sixties. The trip in part became a way to reconnect with who they were. I’ve briefly travelled in neighboring Arizona and did not much like it — too hot and desert desolate for me, at least where we crossed. But New Mexico, as my wife and I started our journey in Albuquerque and eventually travelled to Santa Fe and Taos, seemed to be an environment of more interest — nubby pines, occasional rock hills in subtle earthen hues with mountains in the distance, even some greenery and flowers from recent heavy rains and careful irrigation. And the skies! The big sparkling blue skies, often filled with the most amazing clouds. We stayed at a hotel on the outskirts of Old Town in Albuquerque, and took a day to visit the University of New Mexico. I wanted to see if the university could possibly have any record of my parents. It’s a big, modern campus: young people scurrying to classes in bright sunshine with iPods and smartphones in hand. We tried to find an administration building, and finally found an office where I was given a phone number and an email address for an assistant registrar. In a campus Starbucks, I used my wife’s iPad to introduce myself, and hoped he could check the school’s records. We didn’t hear anything back immediately, and we went on to explore Old Town for the rest of that day. And Santa Fe also has the Georgia O’Keefe museum. Its paintings reflect her passion for the New Mexico landscape, which was a coming home for her to a place she had never seen before. 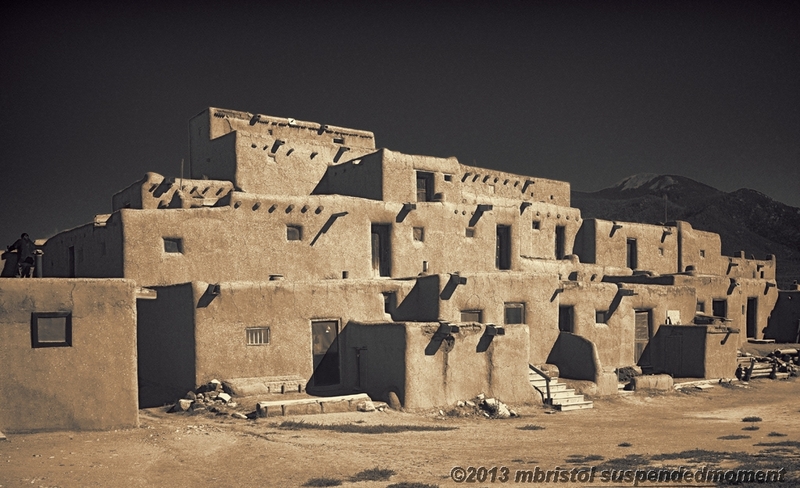 Taos too had its charms, primarily the pueblo which has had people living in it for roughly 1000 years. In Santa Fe we heard by email from the university registrar. Their electronic records only went back to 1950. They would have to search hard copies by hand. What were my parents’ birthdates? 1918 and 1927, I sent back, a little shocked since not really thinking about those dates for many years, how far back they are now surprised me. I realized that had my father lived until today, he would be 95. We’ve returned home now and not heard more from the university, although I hope some young assistant continues to burrow diligently through their dusty records. But whatever they find, or if they don’t, is not so important. When my father was in art school there, he seems to have been fascinated by Roman Catholic iconography. He was not a religious man at all, he had no use for organized spirituality — although I remember he always emphasized that he was agnostic rather than an atheist. But I recall, and my brothers may still have some samples, the stylized and detailed colored woodblock prints of St. Francis of Assisi and the small squared-off sculptures of St. Francis that he had done and kept for years where we lived. This is interesting to me, given my father’s necessarily cruel and violent life during the war and his pre-war affinity for hunting juxtaposed against St. Francis’s storied love of man and animals. I too consider organized religion pernicious, although I have Buddhist and Taoist sympathies, but I made it a point to stand next to the ornate doors of the small St. Francis Cathedral in Santa Fe and have my photo taken by my wife. I’m sure my father and mother must have been there at some time. I like to think my father stood where I stood, and looked out into the New Mexico sunshine. 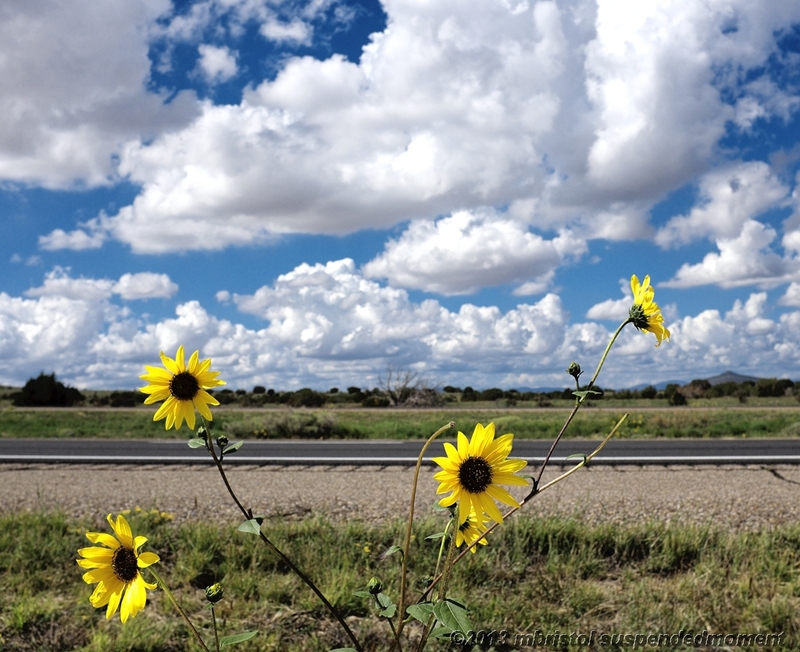 1) Along the road, driving to Santa Fe. 2) The pueblo at Taos. I will be posting photos from the trip from time to time on my photography blog, The Suspended Moment.